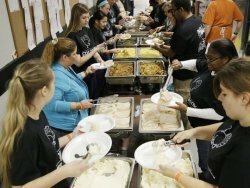 In the spirit of Thanksgiving and charity several organizations across the City will open their doors to help hungry families have a warm meal and converse with people from all walks of life. We have compiled a list of organizations hosting dinners throughout the coming weeks. Each year members of the parish prepare and serve a Thanksgiving dinner. All are invited, and the meal is free. Some members of the parish donate carved turkeys and necessary food items like pies and cranberries. Volunteers are needed for cooking and serving for our local community as we host them for a free Thanksgiving Dinner after services, typically on the Sunday preceding Thanksgiving (starting about 1 p.m.). If you are interested in helping in any way (cooking turkeys or other foods, setting up, cleaning up, serving, etc. ), please e-mail the Parish at office@ascensionchicago.org. The Furious Spoon’s Pilsen location will once again be giving away free meals on Thanksgiving Day between 11a.m., to 3:30p.m., on Thursday, Nov. 23rd. Proceeds of any paying customers will be donated to The Pilsen Alliance and used toward youth programs. Community members are welcome to enjoy a Thanksgiving dinner served by Salvation Army staff and volunteers, including turkey with stuffing, cranberry sauce, mashed potatoes, dessert, and beverage. Many will come because they enjoy the fellowship, others because it is difficult for them to prepare a holiday meal, and for others it is the joy of being able to give to others. No matter the reason, all are welcome. The dinner will take place between 11:30a.m., to 3p.m. 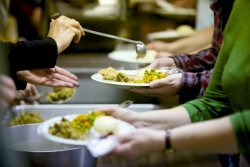 Throughout the month of November, People Church Thanksgiving dinners happening on different dates all throughout the city. The next Thanksgiving dinner will take place on Saturday, Nov. 18th between 4p.m., to 9p.m. Each Wednesday a nutritious meal is provided to 135 guests at the dining hall facilities made available to us by Catholic Charities, located at 721 N. LaSalle Street in Chicago. The meals are donated by local area restaurants, hotels, businesses, board members, friends and their families and members of the community who want to make a difference in the lives of those less fortunate than themselves. © 1738 Chicago Hispanic Newspaper, Lawndale News, Hispanic Bilingual Newspapers, Su Noticiero Bilingue. All rights reserved. XHTML / CSS Valid.